…bohemia…grows numerically and as its prestige (or mirages) attracts destitute young people, often of provincial and working-class origin, who around 1848 dominate the ‘second bohemia.’ In contrast to the romantic dandy of the ‘golden bohemia’ of the rue de Doyené, the bohemia of Murger, Chapmpfleury or Duranty constitutes a veritable intellectual reserve army, directly subject to the laws of the market and often obliged to live off a second skill…in order to live an art that cannot make a living. The avant-garde grew out of a group of creative people who gravitated to Paris and lived in low-income quarters, suffering from neglect and poverty. Outside the mainstream and lacking the outlets that would have perhaps earned them a living, these artists and writers could only gather together and form an ideology of failure. They had failed, they consoled themselves, because they were so “advanced” that the unenlightened public misunderstood them. Simply put, their art was too good, too “avant.” Success was inverted into an indictment of failure and failure was transformed into a badge of honor. It is doubtful that these defiant members of the avant-garde were particularly talented or gifted, for there were member of La Boheme who were quite successful, such as George Sand and Eugène Delacroix. But the formula was high-minded and allowed those who never made a breakthrough an honorable cover for their failure. The avant-garde artist, then, was a mythic creature who was not appreciated or understood by the masses, one who chose to live and work in obscurity and poverty, believing that one day his/her art would be recognized by an educated art audience either in the near present or in some unforeseeable future. ..it is safe to say that the actual career of the term avant-garde was started in the after man of the French Revoluion, when it acquired undisputed political over ones. I am referring to L’Avant-garde de l’armée des Pyrenées orientals, a journal that appeared in 1794 and whose watchword–engraved on the blade of an emblematic sword–was “La liberté ou la mort.” This journal was committed to the defense of Jacobin ideas and was intended to reach, beyond military circles, a broader audience of “patriots.” We can therefore take the 1700s as a starting point for the subsequent career of the concept of the avant-garde in radical political thought..it is, therefore, not by chance that the romantic use of avant-garde in a literary-artistic context was directly derived from the language of revolutionary politics. Calinescu asserted that the modern us of an old military term was linked by 1825 to the arts by socialist philosopher, Henri de Saint-Simon (1760-1825), in his book De l’organization sociale (1825) in which the writer designated the artist as the standard bearer for the future. His follower, Olinde Rodrigues stated, “It is we, the artists, that will serve as your avant-garde, the power of the arts is indeed he most immediate and the fastest.” Without the church and state and their once limitless funds, without the taste and sophistication of the aristocrats, the artists were faced with the middle class as their main audience. This was an audience that wanted to be entertained and were treated by the artists to large paintings that were precursors to modern day movies—-the grand machines or huge paintings that enthralled them with exciting stories. The new audience was composed of the masses, high and low, average people, undereducated, unsophisticated, but not uninterested in art. The kind of art they wanted was that which was easily accessible, easy to understand, entertaining and attractive to look at; something like today’s television programs, that reflected themselves and their interests. For many artists, this new middle class audience was no problem. For other artists, the bourgeoisie was an opportunity. Although the art viewers were trained to admire the large history paintings, the serious minded displays of ancient virtues and obscure myths were not necessarily what the public actually wanted to see. It was easy to please the public and it was easy to displease the public. However, beguiling the allure of the avant-garde, being a leader, the risks were many and the rewards were few. It can be assumed, based upon Pierre Bourdieu’s analysis of the sociology of early nineteenth century Paris, that most of the most avant-garde artists, whether visual or literary or musical, lived and and died as unknown failures. Until the late nineteenth century, the vast majority of the avant-garde artists or the artists called “avant-garde” by art historians, played the game inside the system and were products of the academic system. Being avant-garde involved a delicate balance between “performing” shock and making one’s mark and then becoming ensconced within the system. Eugène Delacroix was the best known example of such an artist. His spectacular, spiraling out of control bloody and violent, Death of Sardanapalus, was shown in the Salon of 1827-8 in aesthetic comparison to classically structured rational classical Apotheosis of Homer by Jean Auguste Dominique Ingres debuting in the same salon. The contrast instantly placed the artists in opposing camps where they remained, in the public’s eyes for the rest of their lives. 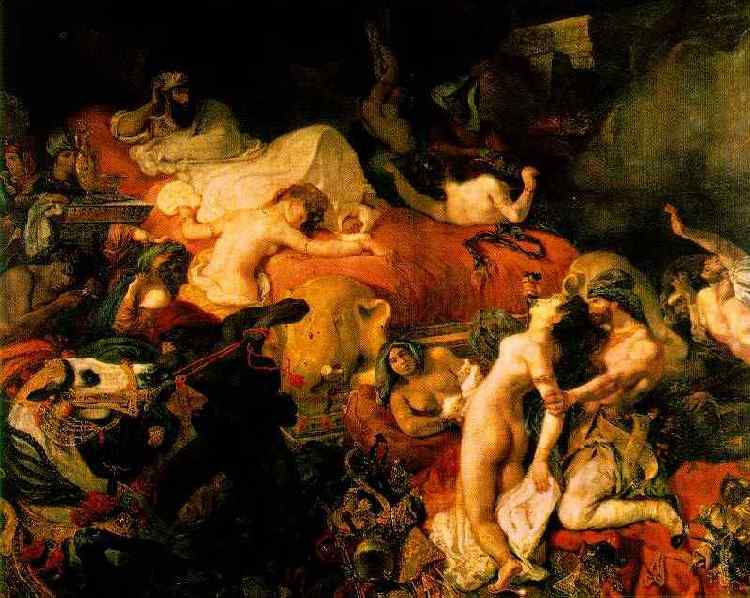 Delacroix parlayed this and other radical paintings–radical in content, Massacre at Chios (Salon of 1824) or radical in style, The Sea at Dieppe (1852)–into a perfectly respectable official career doing murals for the Bourdon ruling family in the 1830s. Norman Bryson’s excellent analysis of these ceiling murals in the Library of the Chamber of the Deputies in the Palais Bourbon in “Desire in the Bourbon Library” a chapter in Tradition and Desire: From David to Delacroix (1984) revealed that the artist combined Romanticism and Classicism in style and content in a cycle of mythology worthy the best of history painting. 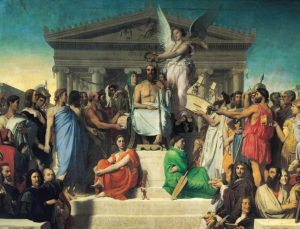 Until the end of the Second Empire, artists found success only by positioning themselves within the establishment, if only to fight against it, like Irgres and Delacroix. But as the century progressed, social and political issues became increasingly pressing, forcing the artistic gaze away from the present and towards eroticism and exoticism and the problems of contemporary times. For the avant-garde artist, the historical past was past. “Il faut être de son temps,” (“It is necessary of be of one’s time.”) the artist Honoré Daumier exclaimed. A growing number of artists sought new ways to make art, which would reflect the new modern way of life.